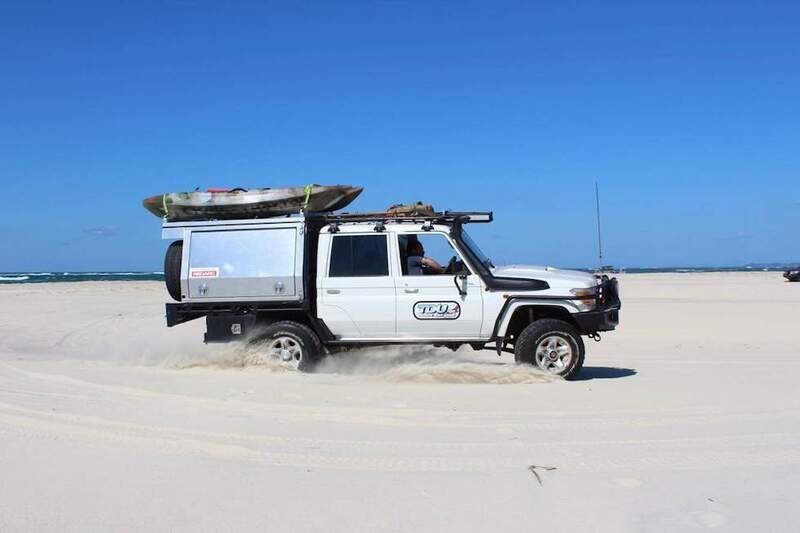 A Great Aussie Adventure! Isn’t that what many Australians have on their Bucket List? A dream to take off and experience the Red Centre? 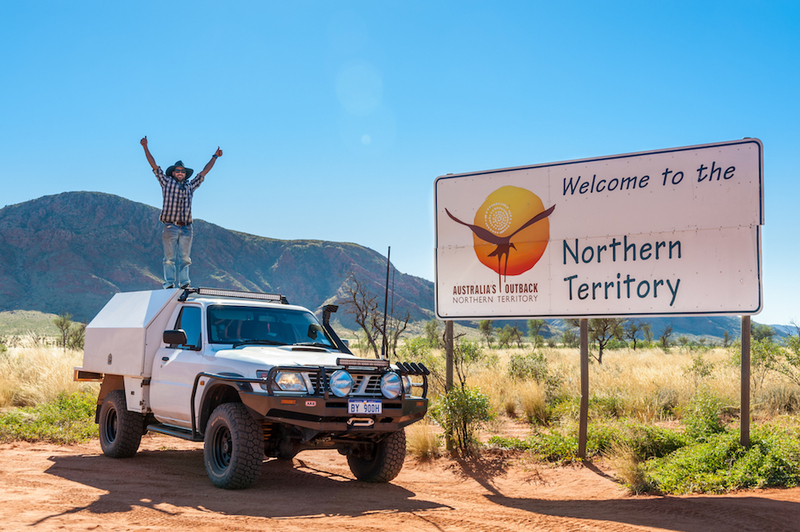 Explore Cape York, hike the famous trails in Tassie, indulge in South Australia Shiraz and tick off as many of the iconic desert four-wheel drive tracks? 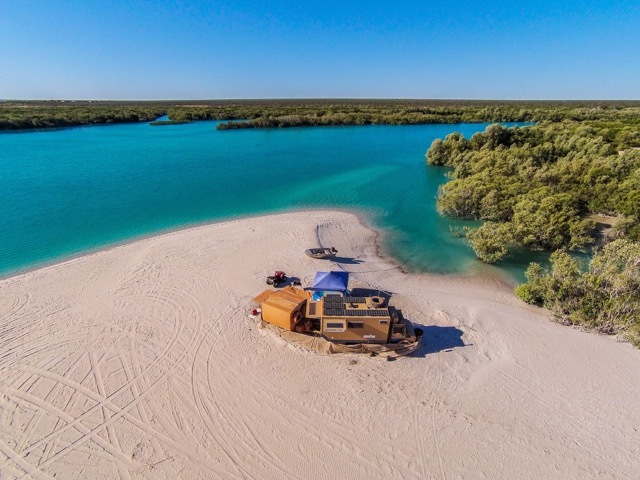 This week we feature Jo and Peter who we met in 2016 on a remote, stunning beach north of Broome. 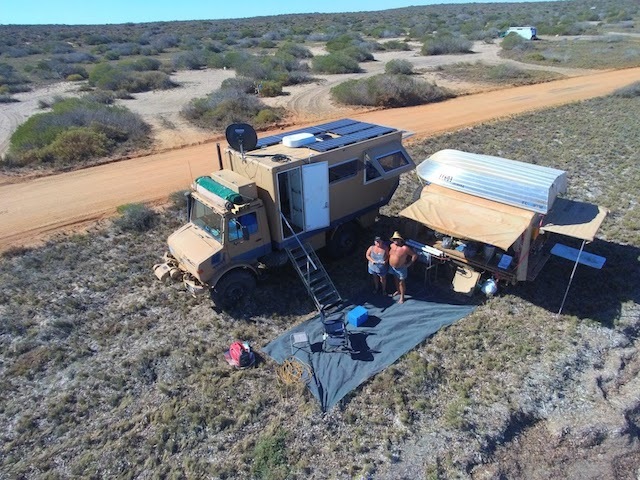 We spent two memorable nights hanging out inside their ‘Unimog’ at ‘Happy Hour’ listening to their tales of adventure and lifestyle choices. Their story inspired us and reminded us to stay true to our dream of seeing more of Australia as efficiently as possible. If you’ve never seen the inside of a fitted out Unimog, then we’d highly recommend following these two on their Facebook page. 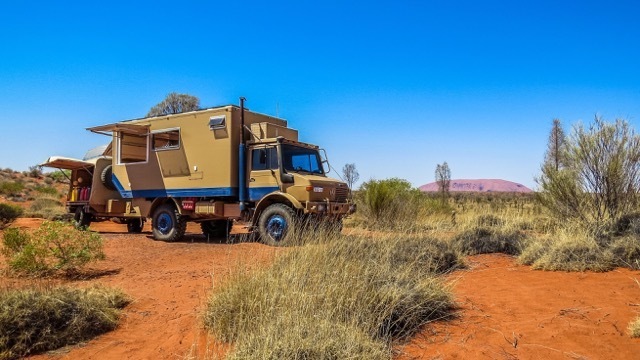 They are one of the coolest travel couples we met on our Australia tour, and their wealth of travel knowledge is impressive. 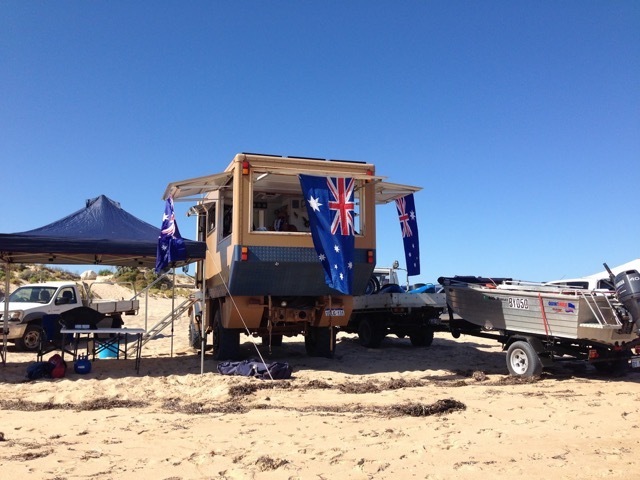 Enjoy Jo and Peters story of their Great Aussie Adventure! Where is your local 4WD playground? All of Western Australia is our local playground. What is the best feature in the Uni Mog? Oh God, so many – LOL. It’s our home, and it’s our happy place. Best features? Well, to live in her full-time there were two important things for me, plenty of power, and a full bathroom and toilet. Also the bed in the ceiling as it saves so much room and of course the verandah out the back feels of the lounge area. Any good stories about the build? We did our build over a year, but to save money for the build, we moved in when the walls were up – haha! The first night we slept in there I was worried we would run out of oxygen in our sleep and never wake up because we had no windows installed yet – Lol. Anyway eventually got a window. What do you enjoy most about your current lifestyle? What has been your all-time favourite 4WD / Touring track in Australia and why? That’s a hard one but here are a few memories and favourites. The trip from Wirrulla up to Townsville was great. 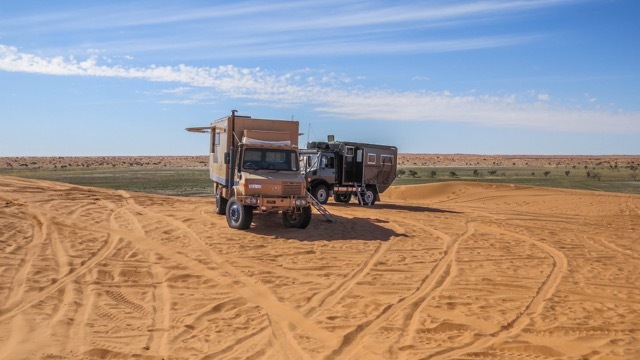 So was the trip up to Cooper Pedy via Kingoonya (loved the crowd at the pub round the fire in the evening), then Oodnadatta, the Birdsville track as we met up with some fellow Moggers at Big Red. Birdsville through to Hughandon via every dirt road we could find. It was quite funny seeing all the four wheel drives tackling Big Red only to get to the top and see three Unimogs – Haha! Also, Willcania to Bourke following the Diamantina was a bloody awesome track! Loved the Tilpa Pub – it had an amazing crowd. Can you tell us the most bizarre experience that you have encountered on a trip? Some campers were burning our chairs. We woke in the night and heard the people next door partying around the fireplace and noticed they had dragged our chairs over to use. We didn’t mind as we thought that we would grab them in the morning until suddenly a massive light woke us from our sleep and we looked out the window to see the fire had shot up and all our chairs were thrown in the fire. Nice bunch of lads I must say. The funniest thing was when Peter was running down beach chasing them with a shovel – Haha. They had youth on their side luckily as he was mighty pissed off. They are all fond really. I love it when the nights are balmy and we can sleep with all the sides up looking at the ocean which is quite rare with the bugs in Australia but when the stars are aligned it’s amazing. We had a couple of months this year at the beach where we could sleep with all the sides up which was very lucky. Another fond memory is the spa in the middle of the desert. Along the Oodnadatta track, one of the stations has put in an artesian spa. It is so warm and the night was so cold which was amazing laying in the spa at night looking up at the stars which are so bright out there in the desert. Barred Creek (North of Broome) which is right at the point surrounded by the Ocean. But wow, we have had so many amazing camp spots it’s hard to pick just one. We loved it in the middle of the desert with our own personal spa and such an expanse of stars. Strzelecki, Oodnadatta to Finke when the race is on, Tasmania, this list is long. 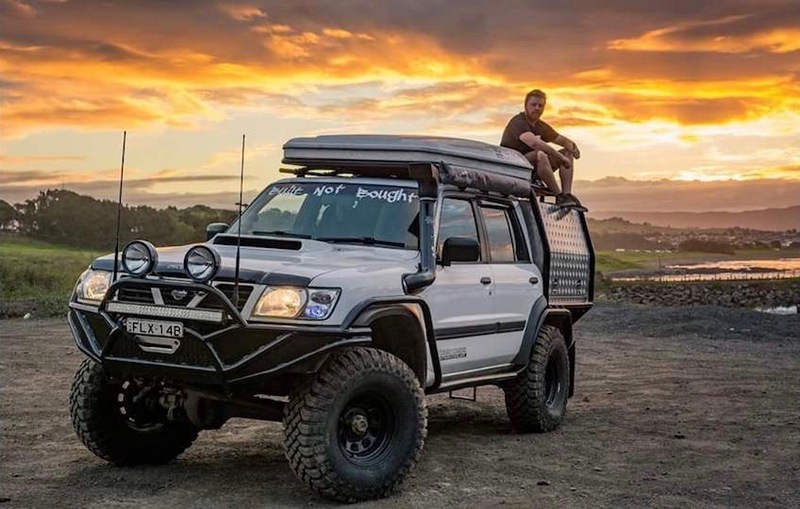 What is your advice to new 4WD enthusiasts? Just get out there and do it in whatever you have! 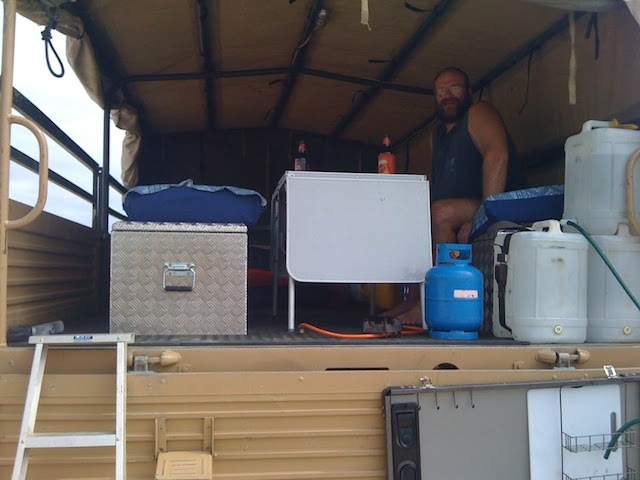 We first started touring Australia with a Troopy and just camped in the back. There is so much to see in this amazing country, so just start in your local area and take it from there. Camping with kids is heaps of fun. We remember spending two weeks marooned on Hinchinbrook island with the kids, hunting for water, living wild. Their fondest memories are of all the camping we did. Name one product you wouldn’t leave home with out. No, well really our watermaker, our generator and our beverage making facilities. Oh that’s not one is it?! I just can’t narrow it down. Let’s say the watermaker as it allows us to stay at places for weeks on end. What are some of the annoying traits you’ve seen in other travellers out on the road?